Building off of the success its had brightening dozens of derelict, downtown Spokane storefronts over the past few years, the cultural vitality-focused nonprofit Window Dressing is thinking even bigger for its next venture. Through the end of July, the arts organization is accepting applications from local, creative entrepreneurs interested in testing out their business model in a brick-and-mortar location, with very low risk involved. A panel with Window Dressing's Creative Enterprise program, as it's being called, will choose up to 15 applicants to be matched with vacant storefronts around the downtown core. The goal is two-fold, explains Window Dressing founder Ginger Ewing: creative entrepreneurs can test the viability of their business in a publicly-accessible space, while property owners can better showcase their un-leased properties to potential tenants. "It gives creative entrepreneurs an opportunity to test their idea with little risk, and that aspect really appealed to us because it builds infrastructure for young and creative people within the city to succeed," Ewing says. To get the project rolling, Window Dressing is approaching downtown property owners, and some in the East Sprague Business District, who currently have spaces for lease that they may be willing to donate temporarily to a creatively-focused business, rent-free. If a paying tenant comes along, the agreement with Window Dressing says the space would be vacated within 30 days for the incoming tenant. Yet the ultimate hope is that the creative businesses placed in these spaces prove to be viable enough to become those long-term tenants. Until that potentially happens, though, the start-ups placed in spaces by Window Dressing are responsible for a pretty low overhead; mainly utilities, business licensing fees and some other manageable costs. As its name implies, the Creative Enterprise program specifically targets creative ventures, Ewing explains, with a focus on people producing handmade goods and products versus reselling items. Nonprofits and other impactful community organizations that would benefit from — and would be a benefit to the arts community — having a storefront are also considered. This new endeavor for Window Dressing was largely inspired by and modeled after the similar program Spaceworks Tacoma, which has had unprecedented success since launching. Ewing worked closely with Spaceworks' organizers to help formulate a plan for Spokane. In the Tacoma program's first year and a half, it placed 36 ventures in otherwise vacant storefronts, with 26 businesses becoming paying tenants in their respective borrowed spaces. She emphasizes that the selection panel for the new program here will pay careful attention to what businesses are placed in any available spaces. "It needs to be a good match on both sides," she says. "We have to think of a higher retention rate as more of a possibility than just throwing any business wherever. 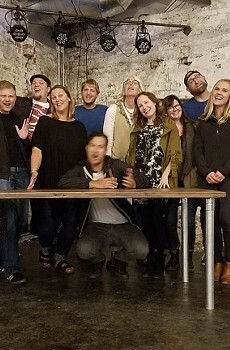 We're going to do our homework to match viable businesses with viable spaces." Before the first cohort of creatives can move into their temporary spots, they'll go through a month-long, specialized professional development course to prepare and learn skills to successfully operate within the temporary space. At the first of two informational meetings about the Creative Enterprise program, Ewing says she spoke to a range of interested applicants, from a cidery to a florist, a T-shirt maker, a printmaker, a leather goods purveyor and a few arts programming ventures. "I think that Spokane is kind of going through a paradigm shift of recognizing the importance of having a strong creative economy," Ewing reflects. "These kind of business are desperately needed for us to succeed and progress as a city in the way that we want to." 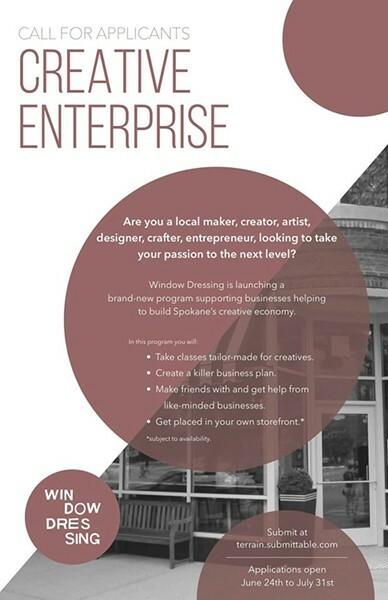 The next session for those interested in learning more about Window Dressing's Creative Enterprise project is set for Thursday, July 14, at 5:30 pm, at Fellow Coworking. The deadline for interested entrepreneurs to apply is Sunday, July 31 at midnight.